A leading Midwest private equity fund was seeking to refinance and expand its asset-based revolving line of credit for one of its portfolio companies. The company is a manufacturer and distributor of aftermarket and OEM automotive heat transfer products. Despite its multiple senior lending relationships, the private equity fund recognized the value of outsourcing the debt placement to an experienced intermediary to drive the process and secure the most favorable financing for its portfolio company. 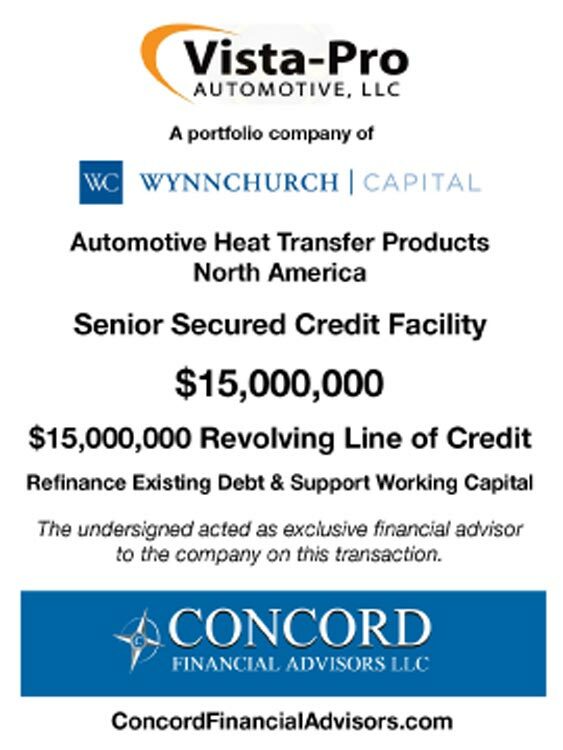 Concord prepared a detailed memorandum highlighting the company’s strong collateral position, projected path to improved cash flows and committed capital from the Midwest equity sponsor. Concord ran a targeted and efficient sales process to traditional bank asset-based and finance company lenders and sourced three bank asset-based proposals. Concord negotiated the three proposals and secured a very aggressive structure with market pricing. Management and the sponsor were very pleased with the Concord process, the final structure of the deal and the market based pricing it provided.